If you’re looking for an easy meal to impress the family, whip up these Gwaltney Pretzel Dogs and dig into flaky goodness. Cook 8 Gwaltney Great Dogs according to package directions. Roll each dinner roll into an 18-inch rope. Wind each one around a Gwaltney Great Dog from top to bottom. Press the dough onto itself at top and bottom so it doesn’t unroll. Boil 3 quarts of water. Carefully pour soda into boiling water. Place 2 wrapped pretzel dogs into the water for about 30 seconds. Remove with slotted spoon to a cooling rack. 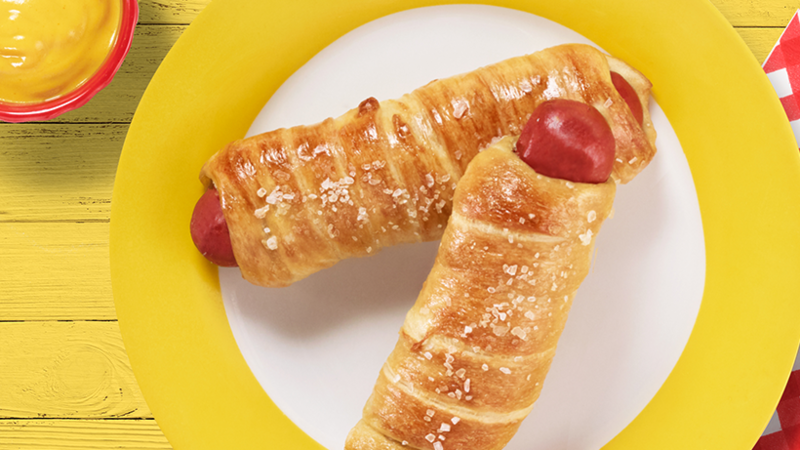 Repeat until all pretzel dogs are boiled. Place boiled pretzel dogs on a sprayed baking sheet. Combine egg and water and mix well. Brush pretzel dogs with egg wash and sprinkle with salt. Bake at 450°F 6-8 minutes or until dark golden brown. Serve with ketchup and mustard.